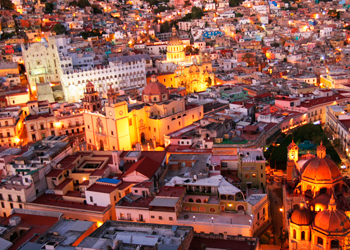 Guanajuato organizes annually (October) the Cervantino International Festival, named after Spanish writer Miguel de Cervantes. This festival promotes cultural, artistic and humanistic understanding between people by inviting other countries and states, which, in turn, present dance, opera, theater, and musical events, as well as a myriad of art exhibits. The festival lasts several weeks on different stages and halls throughout the city. 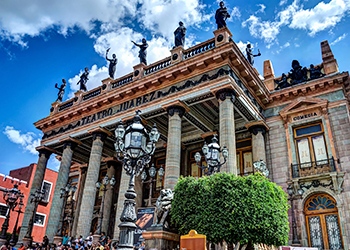 The “Cervantino”, as it is widely known, is nowadays the most important cultural event in Mexico and one of the most outstanding festivals in the Americas, attracting spectators from all around the world. 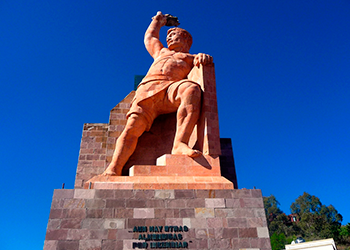 A 28-meter tall statue of an independence hero, atop the San Miguel hill. To reach this place use the funicular (cable car) just behind Teatro Juarez. Juan Jose Martinez, or also known as El Pipila, is the legend of a hero who wore a stone slab on his back to protect himself while crawling to the only door of the Alhóndiga, or granary, in September 1810. The main plaza in Guanajuato is in the small “Jardin de la Union” (Union Garden). Next to it, you’ll see the Juarez Theatre, a mix of architecture part roman, greek and moorish, making it a really beautiful building. Inaugurated in 1903 by President Porfirio Diaz. Nearby you can enjoy a variety of restaurants, colorful streets, theaters, museums, but if you really want to have fun you can ask to the musicians around the streets to take you “walk down alleys”, colonial experience that make you back in time. 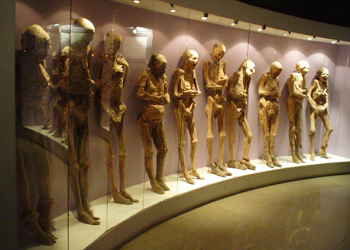 One the most important Guanajuato highlights is The Mummies Museum, where you will find more than 100 mummified bodies of former inhabitants of the city. The story said that bodies appear to have been disinterred arround 1865 because of a local tax that requiring relatives to pay a fee to keep their relatives interred. Ninety percent of the remains were disinterred because their relatives did not pay the tax. The mummified bodies were stored in a building and in the 1900s began attracting tourists. Cemetery workers began charging people a few “pesos” to enter the building where bones and mummies were stored. This place was turned into a museum called El Museo De Las Momias (“The Mummies’ Museum”). A law prohibiting disinterring was passed in 1958, but this museum still exhibits the original mummies. 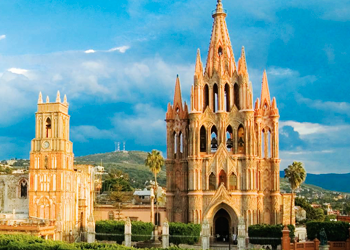 Is a city and municipality located in the far eastern part of the state of Guanajuato in central Mexico. Historically, the town is important as being the birthplace of Ignacio Allende, whose surname was added to the town’s name in 1826, as well as the first municipality declared independent of Spanish rule by the nascent insurgent army during the Mexican War of Independence. However, the town waned during and after the war, and at the beginning of the 20th century was in danger of becoming a ghost town. Its Baroque/Neoclassical colonial structures were “discovered” by foreign artists who moved in and began art and cultural institutes such as the Instituto Allende and the Escuela de Bellas Artes. This gave the town a reputation, attracting artists such as David Alfaro Siqueiros, who taught painting. This attracted foreign art students. Since then, the town has attracted a very large number of foreign retirees, artists, writers and tourists, which is shifting the area’s economy from agriculture and industry to commerce catering to outside visitors and residents. The Cerro del Cubilete (in English, “Dice Cup Hill”) is a 2,700 metres (8,900 ft) mountain in Silao Municipality in Guanajuato, Mexico. 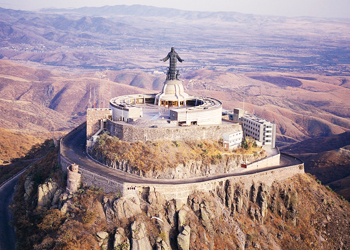 Cerro del Cubilete is one of the most historically important religious shrines in Mexico and marks the country’s geographical center. The current structure and base for the 23 metres (75 ft) statue was created by artist Nicholas Mariscal in 1944 to honour the struggle of the Cristeros. In the words of former Mexican President Vicente Fox, the statue serves as a “rebuke to the suppressors of religious freedom” who sought to quash the Church during the persecution of Christians in Mexico during the first half of the twentieth century.